Enhance your life with a good yarn! Longwoods Alpaca Farm was a small family farm located in Cumberland, Maine, from April 2004 until July 2016, when the last of our livestock was sold. The farm sold in April 2017. The focus now is to help you figure out the best "pipelines" for your fiber while we fix up an old wooden powerboat that's big enough to live aboard. Now, doing business as "Longwoods Alpacas" and based in Southwest Harbor, Maine, I continue to knit and weave using yarns made with our fiber, either at local mini-mills (NEWAIM, Aroostook, Sallie's Fen, or Still River) or through membership in a national cooperative, Natural Fiber Producers. 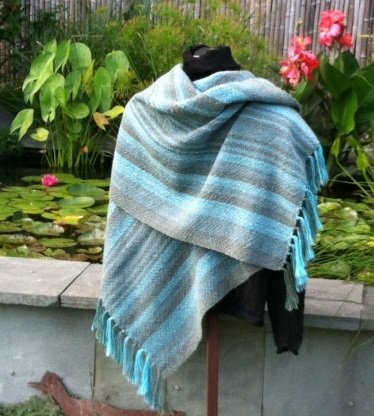 In addition some leg, belly, chest fiber went to Ingrid's Handwoven Rugs or the New England Alpaca Fiber Pool. My hand knits and handwovens are available for sale on this website, as well as at the Maine Alpaca Experience, Shadow Hill Farm, and Justa Alpaca Farm. 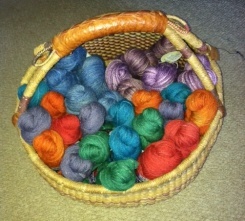 Wholesale accounts are welcome if you have a retail outlet and are looking to sell quality goods handcrafted in Maine. I am passionate about helping you get your fiber into profitable production. The re-emerging US textile and fiber industry is exciting, and I encourage you to put 100% of the annual clip to work. Certified as an alpaca fiber sorter in 2011 through Sorting, Grading, Classing (formerly Certified Sorted Systems), I believe firmly that until you know what you are producing, you cannot put your fiber to its highest, best and most profitable use. Commercial-mill production through Natural Fiber Producers lowers costs to fiber producers and increases the quality and potential profits of a wider variety of products such as yarn, roving, throws, socks, hats & scarves, gloves, fingerless mitts, insoles, pillows and duvets (all available for sale here in Our Store). Feel free to�contact Pam�if you have questions about getting started in the alpaca business or want help figuring out what to do with all of YOUR fiber. © 2014-2017 Longwoods Alpaca Farm, LLC. All rights reserved.